Megan Reilly, Michelle King and Monica Ratliff at Tuesday’s special board meeting. 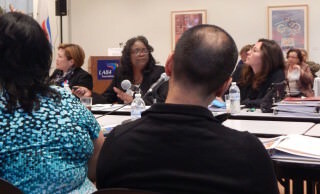 With LA Unified heading toward financial crisis within three years, Superintendent Michelle King on Tuesday kicked off a series of special board meetings to detail her plans for fiscal solvency. Topping that list is keeping kids in the district. Notably absent was cutting staff. King’s initiatives would initially cost the district — roughly $20 million. But the programs, if successful, would bring in about $40 million, her staff estimated. The district’s deficit is expected to be about $100 million by the 2017-2018 school year and hit $450 million in three years. “It sounds like a lot to spend, but if we get double our investment back, or we may even get higher than that, it sounds good,” board member Scott Schmerelson said. Key to King’s plans is boosting enrollment, which has declined by 100,000 in just the last six years. Her suggestions include: increasing attendance by one percent; creating a unified enrollment process to make it easier for families to enroll in local district magnet schools; adding magnet, dual language and International Baccalaureate programs; making more use of marketing campaigns to highlight district successes; scheduling more professional development for teachers, and increasing parent involvement. Some of those projects are already in the works, while others King presented to the board Tuesday and asked for their guidance — and eventually their vote to fund them when the budget is approved in June. King’s plans were drafted in response to a blue ribbon Independent Financial Review Panel, commissioned by former Superintendent Ramon Cortines to outline problems and possible solutions for the district, and the first part of Tuesday’s meeting was devoted to where the budget is headed and why revenue is expected to decline. The panel had recommended that staff be cut to adjust to declining enrollments, but King is rejecting that, opting instead to decrease staff through attrition, retirement and leaving vacancies open, as well as a concerted effort to renew grants that have run out. “We have to align ourselves to what the student population is, and we’re able to shrink the overhead by right-sizing,” King said. Besides, she noted, the panel’s recommended staff cuts would have saved the district only $36 million, while the revenue loss due to declining enrollment is projected at $127 million in 2016-2017. However, according to the review panel’s report, a loss of 100,000 students means district staff would need to be reduced by about 10,000 people, for a savings of about $500 million per year. The report pointed out that the district has instead grown its staff — to 64,348 full-time equivalent positions — increasing its costs for both salary and benefits. Reilly noted that at its height, the second-largest school district in the nation had just under 1 million students, including in adult education, but since 2002 it has lost 200,000 students. 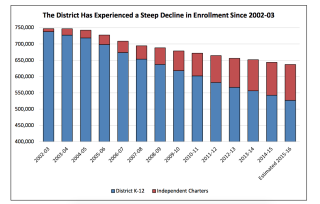 About half of the loss is attributed to lower birth rates, the rest to the growth of charter schools. About 100,000 LA students are enrolled in 211 independent charter schools, the largest concentration of charters in the country. There were 204,124 births in Los Angeles in 1990, but by 2011 they had declined to 130,312, Reilly said. “We don’t have much control of the local birth rates, but we do with attendance and keeping the students going to school,” Reilly said. Since 2002, the average daily attendance rate has increased by 3 percent, and a 1 percent increase in attendance would gain $40 million a year in state funding, Reilly said. LA Unified lags about 1.2 percent behind the state average and aims to bring the attendance rate up to 72 percent of students not missing more than a week of school a year. A survey of students who are transferring to non-district schools found that 36 percent said they were leaving to go to schools with dual language programs and 30 percent went to schools that have an International Baccalaureate program. So King suggested offering more of those kinds of options. She also proposed more marketing of positive messages about district schools, such as current campaigns that include a mobile billboard in Ratliff’s district for Arleta High School and that encourage students to wear T-shirts in the community so the schools are more visible. The district also has campaigns that address chronic absences of students who miss 15 or more days of school, promote dental and eye care in the schools, and promote Restorative Justice programs to prevent bullying and encourage safe environments. Board member George McKenna talked about some of the ways he turned around Washington Preparatory High School by offering incentives for teachers and extra pay to make phone calls to students and to work with them on weekends or after school. Tuesday’s meeting, the first of at least four special meetings, was held at the LA ’84 Olympic headquarters and library in the West Adams district. The superintendent and school board members were seated around a table in a casual setting. Representatives of the search firm Hazard, Young, Attea & Associates, including president Hank Gmitro, took notes on large sheets of paper for the board members to review. Gmitro told LA School Report that this was part of the final portion of their contract with the district when they led the search for the new superintendent. Board member Richard Vladovic pointed out that having the special meetings off-sight will probably lower the amount of public comment that the board will get prior to the meetings, keeping them shorter. “If we have it downtown, we will have longer meetings and we will regret it,” Vladovic said. The next meeting involving the budget is planned for May 3 at 1 p.m., with the location yet to be announced. The board is scheduled to vote on the overall budget on June 21. *The unified enrollment process will not include charter schools.